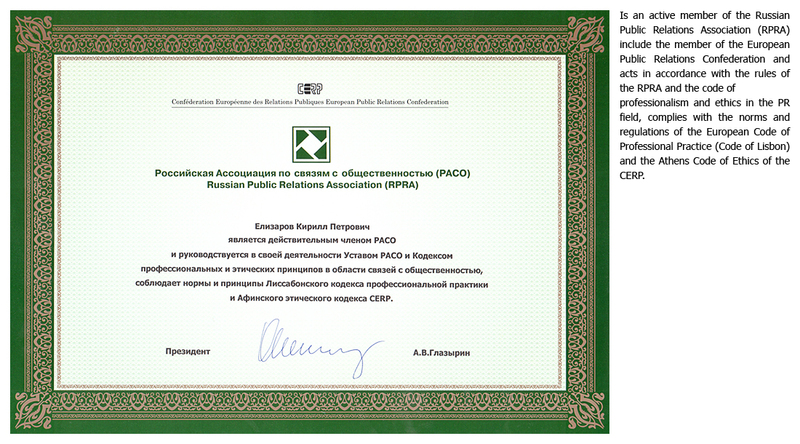 Kirill P. Elizarov is an internationally known Public Relations Expert originally from Russia. He is recognized as a expert in the field of international mass media and public relations, helping organizations and governments, along with their respective communities, to develop mutual relationships with one another. 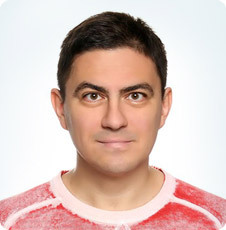 Since the beginning of his career in 1990, Kirill P. Elizarov has been working not only throughout the former U.S.S.R., but also in China, Israel, France, Finland, Monaco, and South Korea. He has also been recognized by prominent business people, government officials, and renowned businesses and organizations around the world. Mr. Elizarov has traveled extensively throughout the world to work on multiple PR and mass media projects. 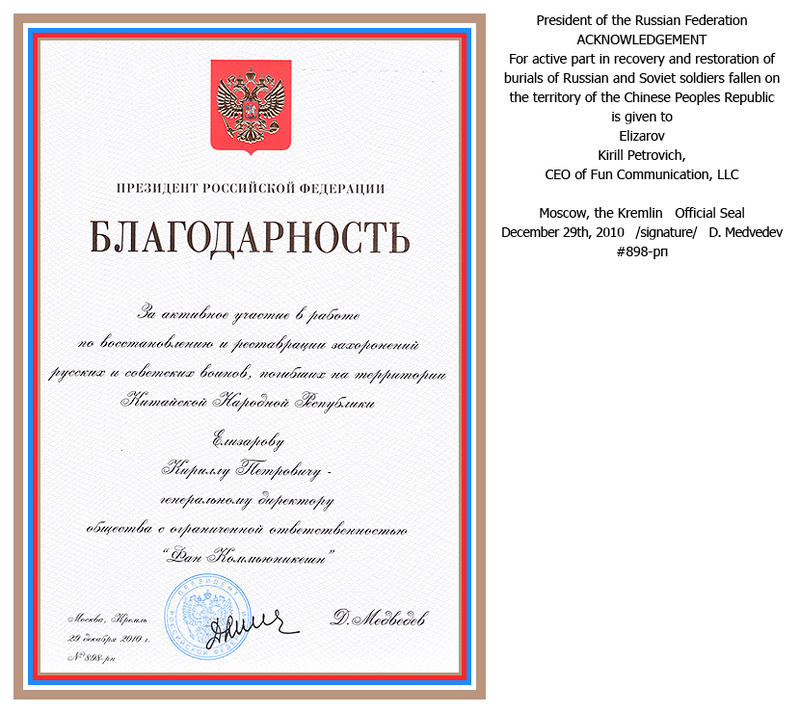 Acknowledgement of CEO of Fun Communication LLC awarded by the President of the Russia Federation “for active participation in recovery and restoration of the burials of Russian and Soviet soldiers fallen in the territory of the Chinese Peoples Republic” dated December 29, 2010. Medal from the Ministry of Defense of the Russian Federation “For Merit In Memorializing The Fallen defenders of the Fatherland”, awarded by the Russian Ministry of Defense, dated October 19, 2009 #1293 for his great personal contribution in perpetuating the memory of the fallen Defenders of the Fatherland. 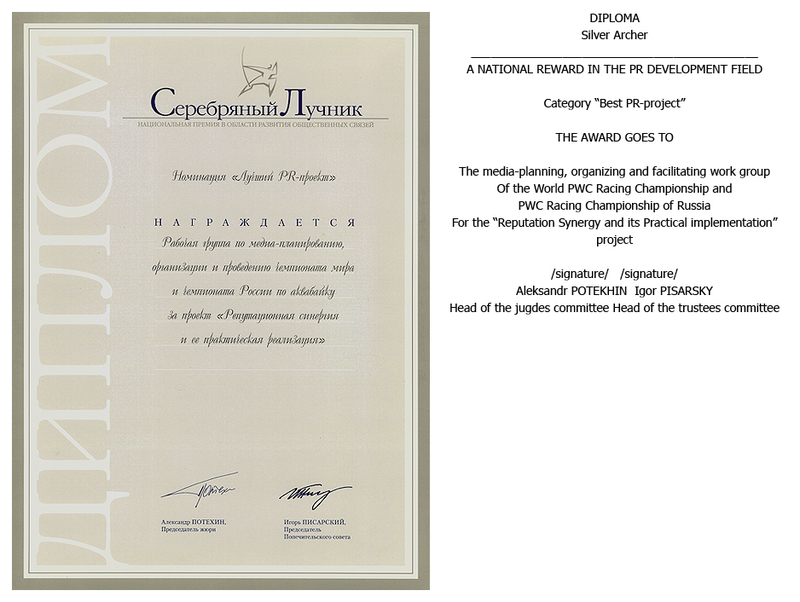 Recipient of the 2005 Silver Archer Diploma for “Best PR project in the Field of sports journalism”, 3rd place in the category "Synergy" for his role in the World and Russian Jet-Ski Racing championship events. 2005 Founder of FUN Communication LLC (www.FunCommunications.com). 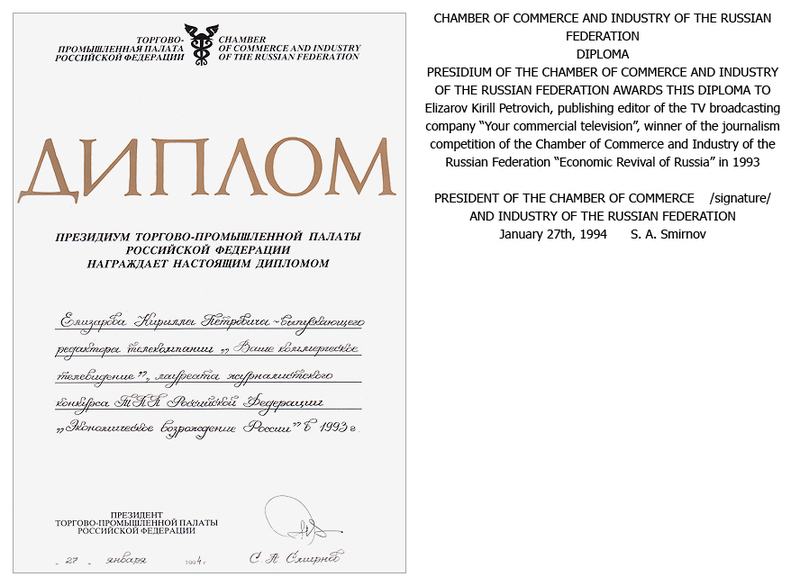 On the list of major Russian clients are: Adidas, Televisa S.A., Davis Cup, MTV Russia, Russian TV channels (Sports, STS-Media), Yamaha, the famous Russian sports brand CSKA (www.cska.ru), RosBank (subsidiary of Societe Generale (www.sgcib.com), Beeline, Lukoil. 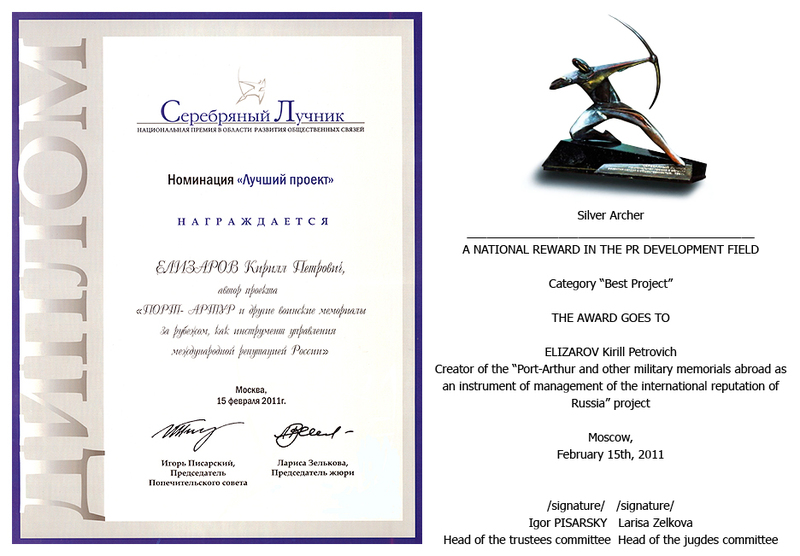 2011 Member of the judges panel (as the Head of the expert Council of "International communications") for the ‘Silver Archer’ Award by virtue of his 2010 Silver Archer Award Winning status. 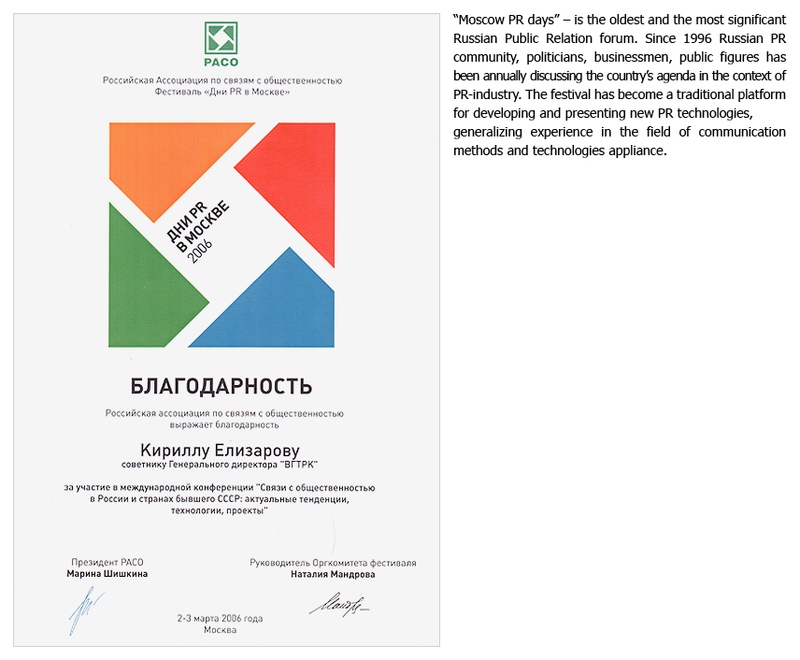 Mr. Elizarov has been elected to be a member of the 2011 competition Jury, along with other 2010 recipients of the award in all other categories. The Adviser to the CEO of 'All-Russian State Television and Radio Broadcasting Company (VGTRK)' which includes TV Channels: 'Russia 1', 'Russia 2', 'Russia 24', 'Culture', 'RTR-Planeta', and etc. Columnist and Head of reporters at the Interfax news agency. Regularly televised program“Money” (NTV channel). March 18-22, 2002, Helsinki, Finland, Participant at the Russian Future-Makers in Finland Programme sponsored and organized by the Finnish National Fund for Research and Development, SITRA.